A U.S. Navy destroyer sailed within 22 kilometers, or 12 nautical miles, of a tiny, disputed island in the South China Sea. 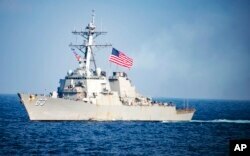 U.S. officials said the USS Stethem sailed by Triton Island, which is claimed by China, Taiwan and Vietnam, on Sunday. FILE - U.S. Navy destroyer USS Stethem transits waters east of the Korean Peninsula during a photo exercise including the U.S. Navy and South Korean Navy during the Operation Foal Eagle. The exercise marks the Navy’s second operation demonstrating freedom of navigation in disputed waters since President Donald Trump took office in January. Two Chinese frigates and a minesweeper trailed the destroyer, a U.S. military official told VOA. China accused the U.S. Navy of trespassing, but U.S. officials said the destroyer was conducting a routine exercise in international waters. Lu Kang, China's Foreign Ministry spokesman said in a statement that the U.S. move was "a serious political and military provocation" and that such operations "violate China's sovereignty and threaten China's security." Twenty-two kilometers is the internationally recognized territorial boundary that extends beyond the coast of all nations. Authorities say the sailing of the Stethem within 22 kilometers of Triton Island, which is part of the Paracel Islands, was meant to indicate that the U.S. does not recognize any government's territorial claims there.